That's right, they've just introduced the facelifted 2016 model, which brings many exterior changes, some interior improvements, and several new engines to the lineup. On the outside, the front fascia has been thoroughly revised, and the rear has also undergone a bit of a nip and tuck. Overall, this new 1-Series looks much more sporty and even somewhat aggressive (especially with the M Sport package) compared to the old one. The updates to the interior are considerably more minor than those applied to the exterior, with the biggest changes being a new center console and some extra standard features. Under the hood is where the magic happens with this 1-Series update. 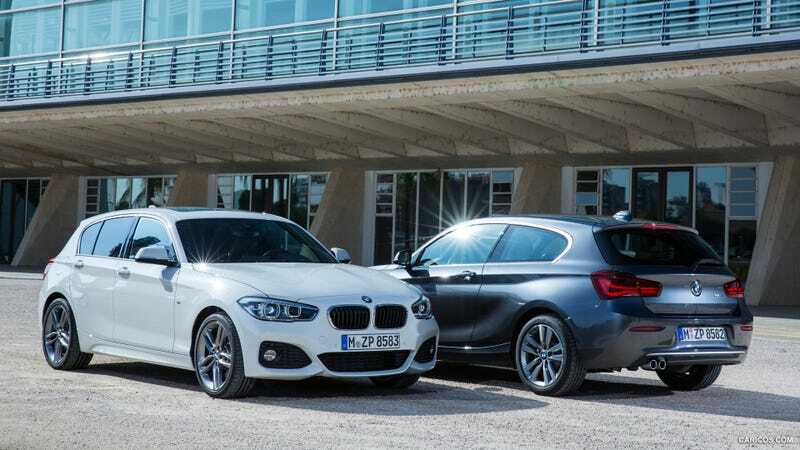 A new 116-horsepower, 1.5-liter, three-cylinder turbodiesel engine can be found in the entry-level 120d model (shown here in gray), and the range-topping M135i hatchback gets 6 additional ponies (up to 326 from 320) from its 3.0-liter inline-six-cylinder gasoline mill.